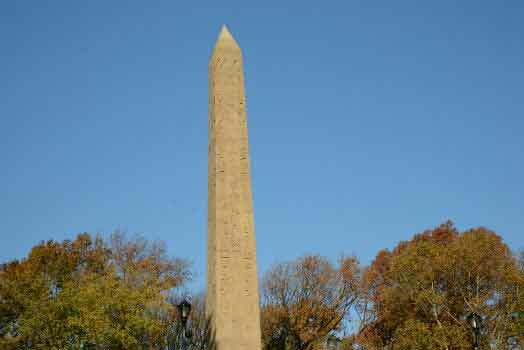 The Obelisk, nicknamed Cleopatra’s Needle, is the oldest man-made object in Central Park, and the oldest outdoor monument in New York City. It is one of a pair of obelisks that were commissioned for Heliopolis on the banks of the Nile circa 1450 BC by an Egyptian pharaoh who wished to celebrate his 30 years of reign. The monuments were then moved to Alexandria in 18AD. They remained there until one obelisk was moved to London in 1878. The second one, erected two years later in Central Park, was offered by the Egyptian Khedive to America in exchange for funds to modernize his country. Transferring the 69-foot, 220-ton granite monument from Egypt to New York was an arduous and delicate process. It took 112 days from the time the Obelisk touched upon the banks of the Hudson River until it reached the Park. Laborers inched the monument on parallel beams, aided by roll boxes and a pile-driver engine. Thousands turned out on January 22, 1881 to marvel as the obelisk was turned upright. A time capsule was buried beneath the Obelisk and included an 1870 U.S. census, the Bible, Webster’s Dictionary, the complete works of Shakespeare, a guide to Egypt, and a facsimile of the Declaration of Independence. A small box was placed in the capsule by the man who orchestrated the purchase and transportation of the Obelisk. He will probably be the only person in history ever to know its contents. In 1989, the Central Park Conservancy restored the Obelisk’s terrace and landscape with new illumination, benches, and paving. From 2013 through 2014, The Conservancy completed a comprehensive project to clean and conserve the monument. Although the primary purpose was to enable further study of the monument and promote its long-term preservation, cleaning the monument had the most dramatic outcome, revealing its granite surface and hieroglyphs that had been obscured by decades of dirt and pollution. The Obelisk landscape is particularly beautiful in spring when the monument is surrounded by flowering magnolias and crabapple trees. Though the Obelisk is often called "Cleopatra's Needle," Cleopatra VII had nothing to do with its creation. In fact, the Obelisk predates her by more than a millennium. Approximately 3,500 years ago in the ancient Egyptian city of Heliopolis, stonecutters carved two obelisks out of granite. Each one was formed from a single piece of quarried stone, and the enormous feat of extracting and erecting the monolith was symbolic of the reigning pharaoh’s power. Both obelisks were inscribed with hieroglyphs praising Pharaoh Thutmose III, who reigned from 1479 to 1425 BCE, and were erected outside of a temple. The obelisks were toppled and possibly burned during an invasion by Persians in 525 BCE; for more than 500 years, they remained buried in sand until Roman Emperor Caesar Augustus discovered and transported them to Alexandria. They were erected in a temple built by Cleopatra to honor Julius Caesar, which may explain how they individually came to be known as "Cleopatra's Needle." In the late 19th century, during a surge of renewed international interest in Egyptian antiquities, the Egyptian government offered one obelisk to England and the other to the United States to further diplomatic relations. Transporting the Central Park Obelisk from Alexandria to New York City was an extraordinary undertaking – it was shipped aboard a cargo vessel called the SS Denton, built especially for the task in England. The Obelisk was rolled on cannonballs through a 360-square-foot hole cut in the starboard hull of the ship; impressively, it took only eight hours to load the 220-ton monument! After a month at sea, the Obelisk arrived in Staten Island. Its journey was far from over, however. It took six months to move the Obelisk from a Staten Island dock to its current location in Central Park, and a specially built railroad was built just for the task. Thousands of New Yorkers gathered to watch as the Obelisk was erected on January 22, 1881. East Side at 81st Street.